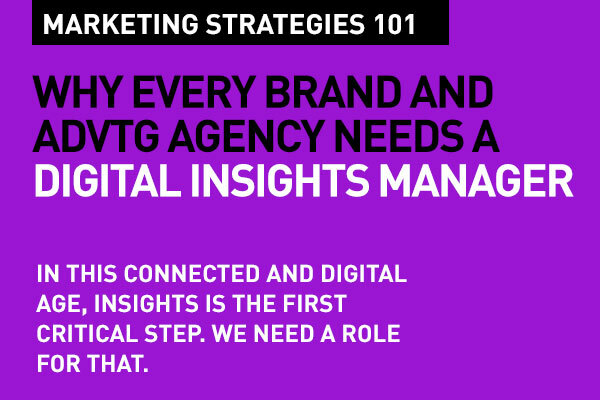 Today, in this digitally connected age, where the consumer, the customer drives the engine of marketing, it is critical to for brands and agencies that work with brands' marketing departments to have a specialized role in managing 'insights'. This is a role that is a high-octane mix of data science, of innovation, of brand guardianship, social media, search – all coming together to provide that business commodity today that is new oil – insight. Marketing today is not about your brand or product – it's about the customer. Digital marketing is built around the customer, the audience you want to talk to, and getting proper insights about your customer, the consumer, their needs is what should be your first and fundamental step. Unlike advertising as we know it, today's digital marketing is way beyond the sell-sell. It's about engaging the consumer, and moving them down the funnel from awareness to action with meaningful, relevant interactions. The first thing you need is a Customer or Consumer (your Target Audience) Insight Strategy. The Insight's Manager's essential role is to drive analytics across Big Data, measurement & learning in Digital, leveraging the social media partnerships – Facebook, Google, Twitter, LinkedIn, Instagram towards providing information that is converted to useful insights for the brand. The function requires supporting marketing and sales, planning and content, building and disseminating learning as well as build and pilot new research methodologies in the dynamic digital ecosystem. The role contributes to a brand's efforts across Paid, Owned and Earned Media. Yes, an ad agency Planner also comes up with valuable insight, but the traditional Planner as we know him or her isn't really using a lot of data converting. Data science is something almost alien to traditional agencies. The Insight Manager's capabilities and expertise includes data analytics at a deeper level – it involves using dashboards, using technology, using expert toolkits to convert data into usable, reliable insight. Every one in marketing knows the importance of data today. What's important to know and understand the three types of data available to us – first party, second party, and third party data – and how do we benefit from it? Data made simple: What is first, second and third party data? That benefit from data – that's the Insight Manager's contribution, and particularly for digital marketing and social media marketing, it is crucial. With the right listening strategy you can achieve a lot to help your social media efforts. Right way, you'll get to know where and when your target audience (your community) is – which platforms they prefer so you can then have conversations with them. You can identify influencers and advocates. You cannot ignore the part social listening plays in improving customer care. It's a great source for feedback. You can target and attract new customers. It helps you generate leads. Overall, listening is the most important component in your social media strategy. It helps and build every other thing you do on social. Read more on The importance of listening in social media, and how to get it right. Regardless of whether social media marketing is being done in-house by a brand or through a specialized social media agency, that function of an Insight Manager remains a vital one. If you are an agency, you need a specialist who knows and understands the nuances of all aspects of digital and social marketing to do that. If you're a brand, this is an extremely useful role within your marketing team structure. Understanding the shifts we have had in marketing today from where we were earlier with the simple AIDA (Awareness Interest Desire Action) model is important. This role navigates the consumer to customer journey via all its various touch points. Media touch points influencing the Path to Purchase today: Marketing Strategy 101. This means a basic understanding of all the connections is important. The one essential responsibility is to answer to the consumer or the target audience's need. That's done through market research, deep social listening, data analytics, clever use of analytics tools, and finally being able to express all of that learning as insight. • Lead and drive a strong learning and developing facility to build a continuous stream of knowledge and understanding flowing through measurement and analytics, both online and offline, and share it effectively. • Development and continuous updating of framework tools – using digital tools and practices for consumer insights. These feed into the marketing teams for them to plan their strategy. 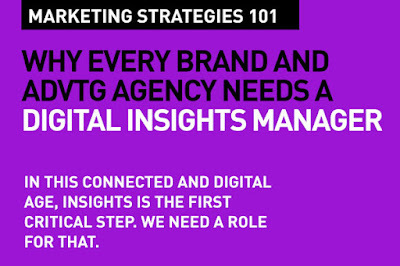 For agency functions, this feeds into creative teams, social teams, account service teams. • Explore and provide guidance to the marketing teams to harness big data, measurement and analytics including predictive analytics in the consumer & marketplace insights area. • Drive marketing modelling and real-life measurement techniques, combining deep analytical expertise and business understanding. This also requires understanding the power of econometric modelling of media. • Define social monitoring, social behavior and measurements that complement traditional analytics and provide frameworks for your brand's social media marketing strategy and content planning. • Continuously scan the external environment to proactively identify and assess new leading-edge thinking, trends and tools in all topical areas of the measurement space to build future forward competitive advantage. That's the innovation bit. • Developing guidelines, toolkits, process flows, learning decks on identified subjects and disseminating to markets and businesses. • Pushing the envelope towards upgrading analytics and listening tools using new technology platforms including mobile for generating consumer understanding and insights on a real-time basis for a wide spectrum of areas. This isn't a new role, it's just that today this requires a lot more than just consumer research or data mining in the traditional sense. Innovation, new thinking, new age connecting with consumers is a key part. As is the ability to use the power of Search – and on the reverse side a grasp of the power of both Paid and Organic Search and the way it contributes to marketing (Read here about Search made Simple: Understanding SEO and SEM in 2016). Then of course, it means totally getting the power of social media – not just on the surface, but understanding the various platforms and opportunities they provide. No, it's not developing social media strategy or planning a content strategy, but it sure can provide some guide posts for those areas of expertise. This is someone who understands today's new world of marketing. This role is not about just following what's hot, what's not, but often being able to find new roads, discover, invent, show how, For example, this role needs to live and breathe in the world of today's consumer where intent is the new black and in the moment is what's hot. It's not an easy role to fill. You need left brain and right brain thinkers. Ambidextrous folks who more than anything, can look at a beautiful sunset and see tomorrow's dawn already. Predictive people. But not predictable people. Find one. Get one. A genuinely skilled Insight Manager will change your marketing world. And That's the basics. That's Digital Marketing Strategies 101. The Insight Manager title and role has been around for most bigger brands because in most markets in Europe they realise the importance of bringing this role within the marketing team. Advertising and media agencies however are still reliant on Planners and Strategy teams to do this job. The way you have described the many facets to this role is amazing. But sadly, this will be a headache to find someone who can do all that... Great post, by the way.